Dr. Michael Walter, class of 1966, who served in the military for 30 years and retired as an Army Brigadier General, was behind the new Upper Columbia Vietnam (War) Era Servicemen Monument, recently dedicated on the academy's campus. 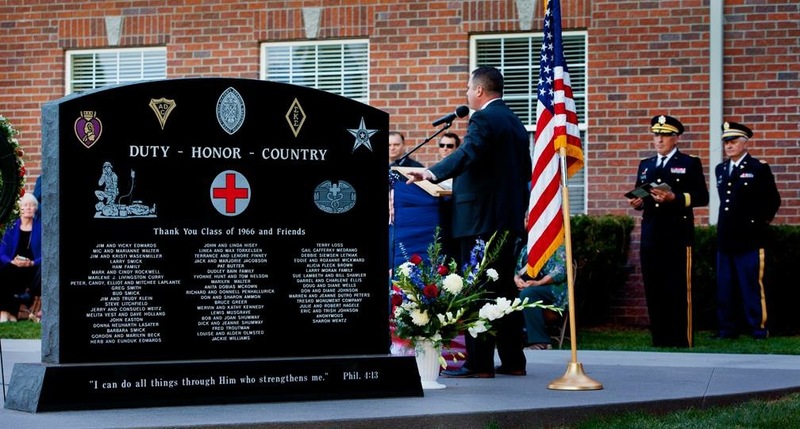 Question: A monument dedicated to 124 boys from Upper Columbia Academy who later served in the US military during the Vietnam era was recently dedicated on the academy campus. You spearheaded the effort to build this monument. Why did you think this was important? Answer: It has been about 50 years since the Vietnam war. Many involved were never thanked and too often scorned. It occurred to us that we should remember and honor those at Upper Columbia Academy who were (mostly) drafted and did their duty with honor. The sixties was a divisive time in our history and those honored here are now part of the less than 1% of the population who served in the military. Our friends and classmates in most cases served not of their choosing and certainly not for fame, fanfare, recognition or money. In the shadow of Desmond Doss, they served in the military usually as medics in Vietnam, as Whitecoats and in numerous other places around the world. There is always a shortage of medics. With the values they were raised with in the northwest, what they were taught at UCA, and what they learned in their medical training in the military, they were successful in a unique mission of saving lives, not taking them. They were dedicated, unselfish Christian patriots who didn’t burn their draft cards or leave the country. In every place they were part of a team working together to support a cause larger than themselves. How many Upper Columbia alumni were killed during the conflict, or during that time? Two died in Vietnam: Tom Dutro and Ken Weitz. I understand some more names are to be added later? As we got into this, we were surprised at how many there were. In addition to the 124, we already have 20 more names to add. We are sure there are more and if anyone knows of someone we missed, they can get in touch with the alumni office at Upper Columbia Academy. How many of the veterans whose names are on the monument attended the ceremony on September 29? What did they say the monument means to them? They were grateful and thanked the Academy for the recognition. For some, it was the first time they had been thanked and it brought closure to the bitterness that some felt. How was the monument funded? How much did it cost? The Monument was funded through donations mostly from UCA alumni. About $50,000 was raised to fund the monument and a video. Was the school very supportive of this project? Do you know if other Adventist academies have similar memorials? The two principles involved, Mr. Winslow and Mr. Johnson, and Vice Principle for Alumni, Julie Hagele, were supportive from the beginning and incredibly helpful. I am not aware of other Adventist institutions doing anything similar to what we did. When were you a student at Upper Columbia Academy? When and where did you serve in the military? Were you drafted? Did some of your classmates join the military at the same time? I was in the class of 1966 and voluntarily joined the Army in 1975 after medical school to do a residency. I was in the active and reserve Army for 30 years and lived in seven locations. I was deployed twice to the Middle East and traveled in Kuwait, Iraq, and Afghanistan. Several of my classmates served during the Vietnam era in Vietnam, in numerous other places around the world and as Whitecoats. Were you all conscientious objectors or did some of you carry weapons? Do you remember that being an issue that was discussed? During that time all men were required to register for the draft when they turned 18 years old. The Seventh-day Adventist Church gave us all guidelines on how to register as conscientious objectors. Most who were drafted did not carry weapons. What do you think the monument means to current students of Upper Columbia Academy? We want it to be a reminder that many Upper Columbia Academy students did their duty honorably when drafted into the military during a difficult time in our history. We want their service to be remembered. Many served in the Army as Whitecoats at Fort Dietrich and that history is too often unknown to the younger generation. The movie, Operation Whitecoat, needs to be shown to the current generation. How do you think the school has changed between the 1960s when you attended, and now? We had a work/study program and I believe that has changed because of labor laws. The other big change is media. We only had the newspaper and no TV or radio or cell phone. I’m sure there are others. What did you go on to do after serving in the military? How do you feel that your time as a soldier changed you? Over 30 years I became acquainted with and saw many incredibly dedicated patriots. They were disciplined and lived by an enviable value system that kept them mission-focused. I saw leadership at its best that all could learn from. It was a life-changing experience in so many ways. I worked at Loma Linda University until 2015 and now work at the Loma Linda Veterans Affairs. Images courtesy of Dr. Michael Walter.